Same as the 2001 home jersey with a few minor changes. 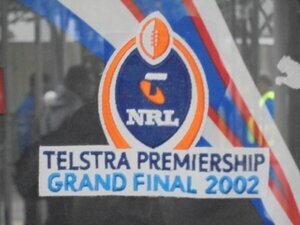 The NRL would have a new logo that integrated the Telstra Premiership logo better and the back would lose the white across the yoke. The biggest change was probably the smallest and that was changing the colour of the Warriors logo from green, white and blue to black and silver. A logo that remains to this day. This change would remove the last traces of the Auckland Warriors. OFFICIAL REPLICA - Sold in huge numbers is still widely available second hand online. It was also one of the most signed jerseys with the Warriors at times signing 100 jerseys in one sitting. Despite the numbers of them available its not easy finding one in great condition as the black polyester has a tendency to fade to a brownish colour and the red collar will fade to pink after too many washes. PLAYERS JERSEY - Exactly the same as the replica but with a number and some jerseys had a slight taper. The number itself was just white. Very rarely do players jerseys come on the market. Most want to keep it as a memento of one of our most successful years and the first time we made the Grand Final. 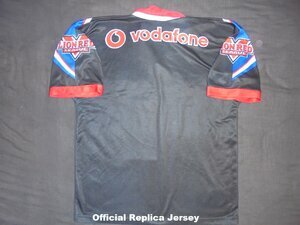 The 2002 home jersey was most famously worn by the Warriors during the 2002 NRL Grand Final loss to the Sydney Roosters. 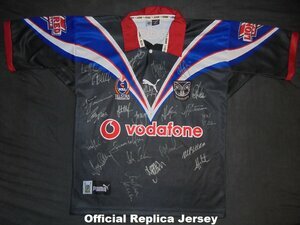 A Grand Final jersey itself is close to being the holy grail of all Warriors jerseys. Even a Grand Final spare jersey would command a huge price.